This shrimp and zucchini recipe has a little kick with the green chili's mixed into the chopped tomatoes. I served this over a bed of Tomato Basil flavored linguine. Quick and easy meals on a busy work day are a delight to make. 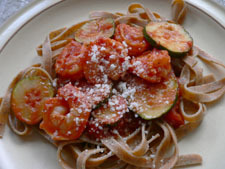 While the linguine is boiling, you are cooking shrimp in the flavorful sauce for about the same time. It's one of my more simple recipes in my collection. This recipe is from Sharon of Lincoln Nebraska given to me over 10 years ago. And over the years I have prepared the dish so many times and have made slight variations to mine and my families likes. That is what I truly believe makes cooking so much fun. Prepare pasta as directed on package. While pasta is cooking heat oil in a sauce pan, add garlic and cook 30 seconds or so. Stir in can tomatoes (including liguid), tomato paste, sugar, vermouth. Cook another minute stirring constantly till blended. Add salt and pepper, shrimp and zucchini slices. Cook for 8 minutes until shrimp are done. Liquid should be completely reduced from the sauce by this time. Put pasta on serving dishes, top with shrimp and sauce and sprinkle with grated cheese. Serve immediately. Tips: Rotel has a good canned tomato and green chili mix. That is what I used and loved the flavor. If you do not have vermouth, any sweet red wine will work. I used tomato-basil flavored linguine but you can use any pasta you have on hand. Serve with one of the Easy Salad Recipes and crusty french bread for a complete meal.